Lithuania celebrate their gold medal win. Photo courtesy www.fibaeurope.com. 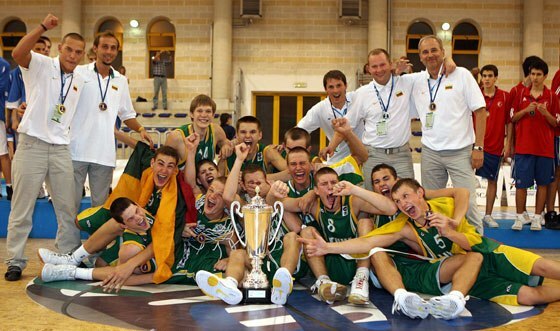 Lithuania’s Under 16 Men’s basketball team won gold decisively in the European Championships in Italy 15 -24 August 2008. In the semifinals they beat France (73:47) and in the finals absolutely demolished the Czech Republic (75:33). This consoled Lithuania’s basket ball fans, after Lithuania’s basket ball team failed to win the bronze in the Beijing Olympics. The triumph of the Under 16 Men’s team in the championship followed on the success of the Under 18 Women’s team, which earlier had also won gold. In the European Championships the Under 18 Men’s team and the Under 20 Men’s team were likewise very successful and each team finished with sliver. The future of basket ball in Lithuanian seems to be assured. It is interesting that a member of the Under 16 Men’s team is Tautvydas Sabonis, son of the legendary Lithuanian basket ball star Arvydas Sabonis.